A web app cannot have a menu bar like a desktop app, but it can have menus. Two places that menus are used are in Contextual menus for controls and for Menu Buttons on Toolbars. In both cases, you use the WebMenuItem class to create your menu. Below is a list of commonly used properties and methods for a Web Menu. Refer to WebMenuItem in the Language Reference for the complete list. A Variant value that is associated with the specific menu. The text that is displayed for the menu. 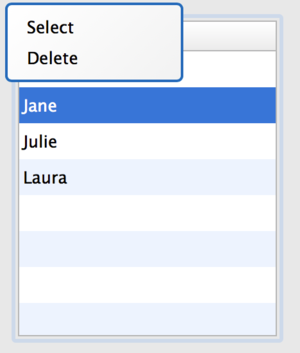 Use the Constructor to quickly create a menu with its text. Adds a menu to a menu. The user can now right-click on the button to show the menu. The ContextualMenuAction event is available for all web controls.